For those of us that love and know our dogs, or if you are adding a new four-legged member for your family, you will know that a dog’s needs and requirements are not straightforward. Even when it comes down to choosing a decent dog bone. They need quite a bit of necessary equipment, food, and water bowls, a decent collar, a leash at least four feet long, a decent and practical bed, proper ID tag with essential contact details, a travel crate…the list goes on. Of course, the finer details when it comes to feeding can depend on what breed of dog you either have or are planning to have. Larger dogs will have very different needs to smaller dogs, and size aside, there are also dietary considerations to think about. Puppies to older dogs will always want to chew, essentially you will want to have a happy dog. In this recent update, we presented to the reader more helpful information on how to choose the right bone for their four-legged furry friend, including direction on picking the right size and kind. Also, included is how to pick the healthiest option along with other helpful pet care information! But before we go into the nitty gritty eating habits and preferences, it’s a fact that our four-legged best friends need a variety of other things as well. An accessible bone for them to chew on is always a good item to keep them busy. You wouldn’t bring a baby into the world without getting things ready and making sure you had prepared the best you could. The same is right regarding a dog. The decision to take one on is not one to be taken lightly and you should be aware of possible pitfalls as well as the great moments of joy you can expect. This peanut butter filled bone boasts being packed full of flavors any dog will enjoy, it benefits from being available in a variety of pack sizes; 1, 2, 3 and 5 bone packs. It measures in at six inches by 2.5 inches and will provide many hours of enjoyable chewing for most dogs, weighing in at a good eight oz size means it should last even the fastest chewer. 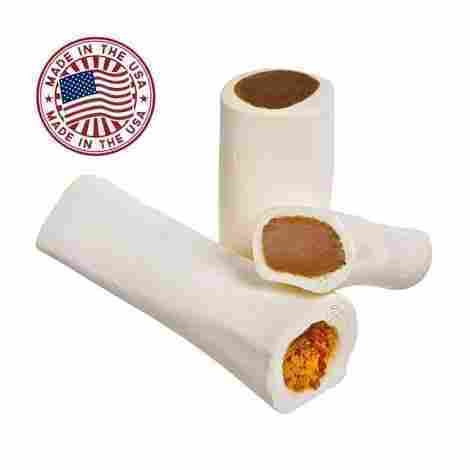 Made in the USA, these tough peanut butter filled bones will stay fresh and enticing for hours on end. 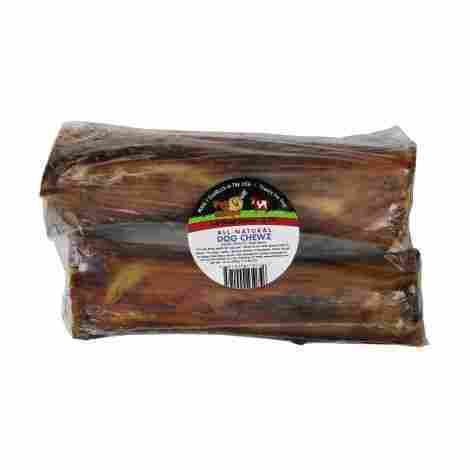 The Redbarn filled bones are beef bones filled with tasty flavour, they proffer not to have any unpleasant odors and so will be suitable for using within the home. The filling is thick enough to stay put within the bone until chewed out. This bone offers great practicality in that it can be re-filled instead of thrown away and replaced, and it also offers a longer period for grinding through the toughness of the bone. They are particularly suitable for medium to large dogs due to the overall size. 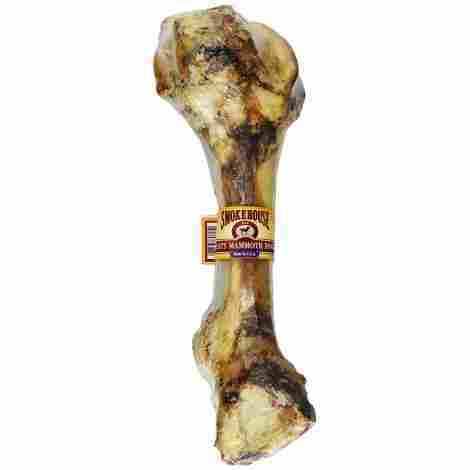 The value offered with this Redbarn peanut butter filled bone reflects well in the price, the long-lasting bone and flavor-filled center will provide great value for the money paid. The bones are also available in 2, 3 and 5 pack sizes for greater convenience. 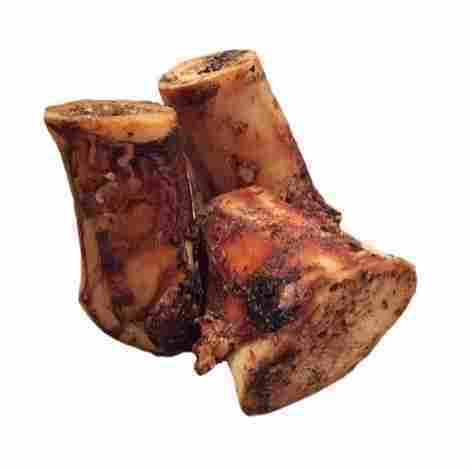 These Jack & Pup premium grade shin bones are roasted and then smoked with meat and tendons to provide a meaty treat. They benefit from being filled with marrow which has natural calcium and boasts being suitable for dogs who are aggressive chewers. 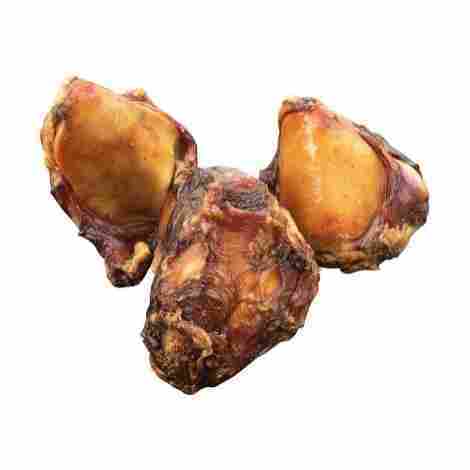 Offering naturally sourced shin from free-range cattle, these premium grade shin bones have essential nutrients within them including omega 3, vitamins and minerals like calcium and iron. They proffer to increase energy and help keep a balanced immune system. The shin bones are guaranteed to be completely safe for digestion and boast having no side effects after consumption. These treats offer a healthy, all natural snack that combines goodness and a single protein filled ingredient that will give hours of healthy chewing. The Jack & Paws premium grade shin bones encourage chewing which in turn helps to keep teeth, gums and breath healthy. It boasts helping remove tartar build up and reduces the possibility of gum problems. It is also boosted by the chewing action that strengthens jaws and gums. When taking into consideration the overall cost and value of this product, it is easily well balanced and this is no more evident than in the pack quantity of three. The safety of the bones combined with the added health-related benefits ensures this is great value for money. These Lily’s choice dog bones have been created with aggressive chewers in mind and are available in handy pack sizes comprising a two pack, a three pack and a twelve pack. These USA made dog bones boast being both mold and crack free – verified by quality inspections before they leave the production line. The grain-free ingredients offer a tasty and wholesome treat for most aggressive chewers and are a long-lasting premium shank that is a high-quality treat. The bones are produced within a factory that has the benefit of having achieved a global food safety initiative certification. This gives confidence not only in the final product itself – but also in the entire production process and gives added peace of mind. The healthier choice these bones offer encourage chewing and saliva production that can help to reduce tartar build-up and clean both teeth and gums. They also proffer being re-fillable so a favorite paste can be reloaded without having to keep changing the bone. The overall cost and value of these bones are equally reflected in terms of the certified production, the refillable quality and the confidence in the product the onsite quality control. The multi-pack size availability increases the value further through cost-cutting. The Pet Cuisine puppy treats are designed as training snacks and are readily available in a variety of pack sizes, staring at a small 9 oz bag and small 12 oz bag, to a medium 3.5 bag, medium 9 oz bag and 12 oz bag, and a large 12 oz bag so most sized dogs are catered for. They boast being a useful training for puppies, right through to becoming a loved treat for the growing dog. The treats offer a reduction in tartar build, help to clean teeth and strengthen gums and jaws with effective chewing techniques. The ingredients boast being 100% natural which includes high protein chicken and premium rawhide, and are long lasting, are produced to be low in fat and easily digested which gives peace of mind when giving dogs a well-earned treat. The dog treat production process is approved by both the FDA and the USDA, and they also have the benefit of being completely free from all additives, preservatives, artificial colors or artificial flavors. This gives greater confidence in giving the healthier treat. The quality of the ingredients, combined with the added peace of mind of the healthier, natural production process gives these Pet Cuisine dog treats great balance when considering both cost and value. The convenient multi-sized packs and weights add to the overall value. These Pawstruck filled dog bones have a great range of filling flavors including peanut butter, cheese, and bacon. They boast being USA made and are stuffed femur bones that offer a helping hand with oral care and reduce tartar and plaque build-up; as well as exercising jaws and keeping teeth clean. 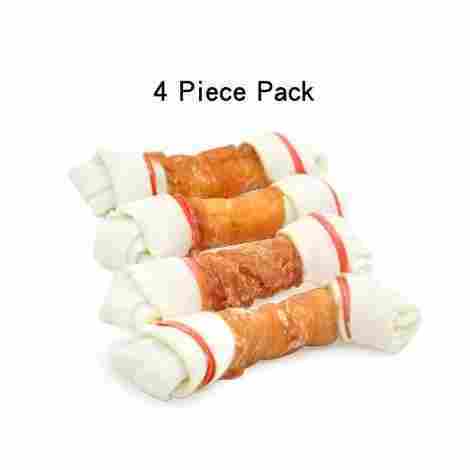 Each pack has a white five to six-inch femur bone filled with a variety of fillings to keep most dogs interest for a longer lasting and more satisfying chew. The cattle used for the manufacture are free range and benefit from being grass fed for quality assurance, and this is backed up with approval from both the FDA and the USDA; a further approved inspectorate is from an outside third party. The production process includes the slow roasting of American white bones that helps to keep the full meat flavor locked inside, and proffers to be long-lasting and satisfying for dogs. The added bonus of improved dental care is a boost for these bones. Filled with peanut butter, cheese, or even bacon. These dog chews boast being an all natural product that contains no wheat, corn or soy and also has no additives, preservatives or artificial colors. They are produced for medium to large dogs who are aggressive chewers and made to last. They are both made and sourced in the USA and make the taste better by leaving more meat on the bone for further enjoyment. Being of ample size; at 3 x 6 x 9 inches they weigh in at a wholesome 2.35 lbs per bone. The Pet ‘n’ Shape beef bones are real bones that are sourced from free range, grass fed cattle to ensure a heartier snack for the bigger dog. The chewy treat is available in a good variety of different sized packs to make it more economical to buy. The chews are produced by a slow roasting techniques that aim to retain the flavor and goodness of the product, and this helps to enable easier digestion so reducing the possibility of blocking and unpleasant stomach problems. 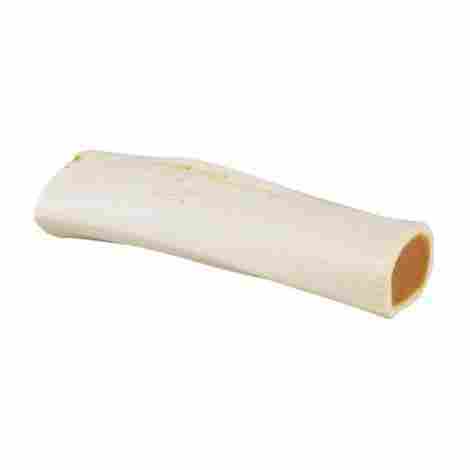 These healthy and large dog bone chews are well equalized on both the overall value and the cost, the size of the individual bones gives plenty of long-lasting treat for aggressive chewers. The quality of the product and the lack of additives gives great value for money. This Redbarn Ham Bone is natural and benefits oral health by encouraging strengthening jaw muscles and helping to reduce tartar build up. 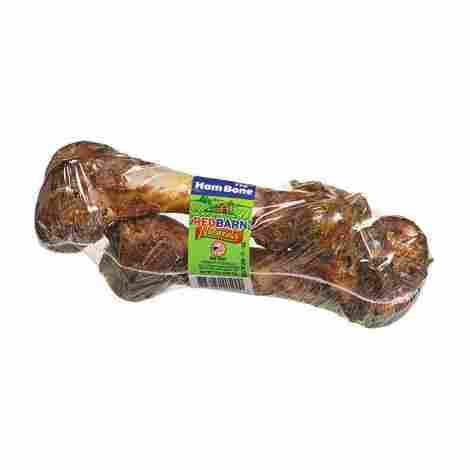 The pork femur bone is lightly smoked and is produced with smaller dog breeds in mind. The hard, real bone helps to clean teeth and keep gums in good shape, and the size is particularly recommended for teething puppies who are constantly chewing the leg of the priceless table, it also helps to satisfy a dog’s natural tendency towards chewing. 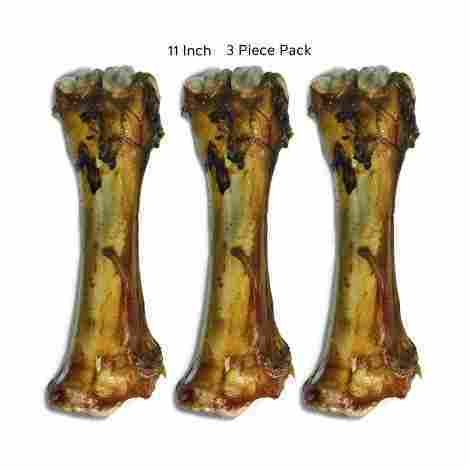 The handy bone size makes giving a well deserved and tasty treat that little bit easier. 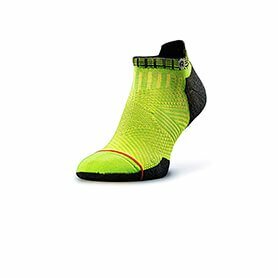 They are available in two convenient sizes for families of all sizes and they are handy enough to fit into a bag so good behavior can be rewarded on any trip. The lightly smoked pork is complimented with tasty bone marrow for extra enjoyment. The nutrients provided with both the marrow and the pork give a regular treat that something special. They are individually shrink wrapped to maintain optimum freshness. Overall, the value of these Redbarn Ham Bones, when compared with the cost, is equally great and is money well spent. The different sizes make them economical to buy and the freshness provided by the shrink wrapping is a bonus. Dogs will like the taste. These choice knee caps are quality assured and made in the USA, with a global food safety initiative certificate. They are available in three handy, convenient sized packs; three x kneecaps, ten x kneecaps and a bounty pack of 30 knee caps for great economical value. They boast being completely grain free and offer an exceptional treat for most dogs, they also benefit from being quality control tested before shipping to make sure they are as fresh when they are received as when they leave the production line. The healthy choice of providing these treats can help prevent plaque and tartar buildup on a dog’s teeth, and they help to strengthen jaw muscles through the natural chewing action. The flavor is optimized by the free-range cattle who are grass fed. The full benefits of the free-range cattle are multiplied with the long-lasting chew these knee cap bones offer. The convenience of the pack sizes makes them always available and close to hand when that special friend deserves a treat. The value and cost of these Lily’s choice kneecaps are well balanced and justified with the combined pack sizes and the natural production. The long-lasting bones are a great value, and there is greater confidence in the product with the GSFI that comes with them. These 100% USA made smokehouse treats are completely all natural beef bone, it is perfectly slow roasted and smoked to increase the rich meaty flavor that dogs will adore. They are long lasting and are guaranteed to keep even the biggest dog happy. They weigh in at a healthy 2.95 lbs each and measure 6 x 15 x 6 inches so there is plenty of bone to get stuck into. The smokehouse treats are full of natural nutrients that will compliment any diet. The treats are designed for moderate to aggressive chewers and there is plenty of extra ‘bits’ to keep even a fussy dog happy. There is sufficient meat, cartilage, and fat to offer a well-balanced treat that is ideal for a short period daily. The natural ingredients in the bone are not lost in the roasting process and the flavor is enticing and irresistible. The motion from chewing boasts the ability to strengthen jaw muscles and reduce both plaque and tartar buildup that can lead to gum disease and other oral health problems. When taking into consideration the long lasting bonus that these Smokehouse treats to offer, and combine that with the nutrients roasted in them, the benefits of both cost and value are well balanced and the treats really are good value for money. 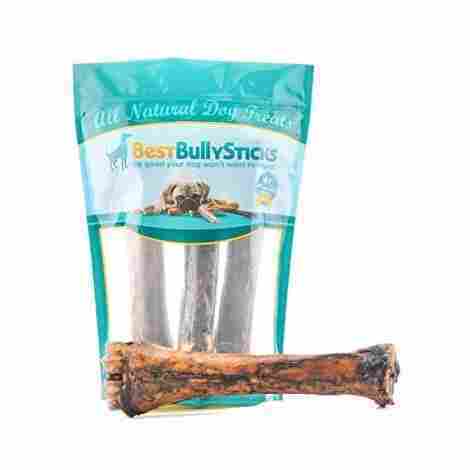 These Best Bully Sticks are jumbo shin bones boast being 100% natural and offer a source of calcium as a bonus which is good for maintenance of healthy bones and teeth, and also helps to clean teeth and gums. They are available in convenient packs of three and are suitable for medium to large dogs, their extra large size is also a great bonus for aggressive chewers and encourages jaw muscles through the natural action of harsh chewing. The shin bones are slow cooked and smoked which keeps in all the meaty nutrients and real flavor to keep even the fussiest dogs happy. The preservation of the goodness provides not only a healthy and tasty snack, it is a great way to treat good behavior. The cattle that these shin bones come from benefit from being free range and are free to graze on grass. This encourages a healthier animal and bones and this is beneficial for producing a good healthy bone full of natural nutrients and goodness. The natural grazing and free-range animals this product is made from, give it a real boost in terms of value for the comparative cost. The oral health benefits it offers provides an extra bonus and the sheer size and easily digestible shin bones ensure good value for money. You wouldn’t just eat anything yourself or feed your family anything without considering the overall healthy balance, and just the same needs to be a priority when you are feeding your dog. It is always important to give your dog the best chance for a happy, long and active life and there is no better way to encourage this by getting the feeding correct for your specific friend. It is common practice to try to include variants from six major food groups to get the right nutrients for your dog. Water, (obviously – is a prime essential), vitamins, minerals, certain fats and oils, carbohydrates and proteins. Types of dog food often consist of either complete foods, wet foods, and dry foods. Many of us probably mix it up a bit to give our friends the variety they deserve – after all; we wouldn’t like the same dinner day in and day out. Wet foods are widely available in cans, pouches, and trays, they are quick and convenient and ideally should be served at room temperature. For safety too, it’s best not to leave any wet food out for longer periods of time due to possible bacteria/bug build up. (Although there shouldn’t be leftovers if your dog is feeding correctly.) It isn’t as cost-efficient as dry food but it is good because it gives a variety of different nutrients, textures, and flavors that are good for your dog’s digestion. On that note, it is also a good practice to wash feeding and watering dishes daily. Dry foods are often offered as a compliment or treat when given with wet food, the nutritional value in it alone is not substantial or healthy. If you want to feed your dog on dry food completely – you should always head for the ‘complete’ food to make sure your dog is getting everything they need to help sustain them and keep them happy. Smaller dogs should be fed mostly dry food to help with tartar buildup. Another consideration to be aware of is the safety aspect of giving your dog a bone. We always think of dogs in the old sense – they are pack dogs and must be given a bone to satisfy internal conditioning. Well, this is true to a certain extent – but do we really know if bones are safe for our dog? So, are bones good for our dogs? It’s fair to say the jury is definitely out on a fixed verdict, but it is important to know a few facts before we go throwing any old bone down for our dog. On the plus side bones are a great source of calcium and phosphorus – two healthy nutrients that are essential in the diet, chewing is said to ease boredom and creates stimuli for the jaw. On the negative side, cooked bones can splinter and break apart during eating and digestion – this may have detrimental effects on teeth, enamel and even on the digestive tract. Larger chunks of bone, if swallowed may get stuck inside your dog and cause painful blockages that may require specialized treatment. Not to mention the mess that can be left behind if your dog doesn’t clean it all up. Raw bones are stronger and won’t splinter in your dog’s mouth or insides but may cause stomach upsets with bacteria. It is commonly recognised that it is better to give your dog a large bone for about 15 – 20 minutes a day, and to keep a watchful eye as they chew and play, if you notice chunks coming away then remove them and replace the bone for one of a more substantial size to reduce the risk of choking. A bone is a bone, right? As a descriptive word yes, but not when fundamental individual differences can be crucial to understanding when obtaining one for your dog. Raw bones are generally thought to be better for your dog, but what type? Two such examples are long bones; usually, weight bearing so have plenty of marrow on the inside and a smoother surface with possible cartilage left attached at the ends. Flat bones are sourced from the back, ribs, pelvis, and shoulder and are generally softer than long bones and have a rougher surface. Filled bones are becoming more popular and widely available, they are raw bones that have been filled with a nutritious flavored center that can keep a dog happy for hours. They proffer to be long lasting so can be washed and stored for longevity, and your dog will find it a rewarding challenge to get to the yummy center instead of just munching and chewing on a bone. Many filled bones have a variety of flavors to suit your dog and profess to help with dental health. You should always get the right sized bone for your dog, it isn’t advisable to give your large dog smaller bones for example because they will be able to break them down to easily and swallow chunks in one go. Likewise, it is not advisable to give a medium or smaller dogs bones which are of a small size that they too can break easily. On the safety aspect, make sure you get the right size bone for your size dog. This is also important for the dog’s health internally and orally. So, bones are good for your dog in the right proportion, under a watchful eye and when chosen well. But there are also some practical no-no’s when it comes to giving your dog a bone. First and foremost, you should never give cooked bones, as noted earlier they are prone to splintering and causing painful blockages. Smaller bones in chicken carcasses should always be avoided for the same reason, they can cause damage and even choking when wolfed down by a zealous eater. Raw bones are better with meat on them, this not only provides better nutrition but releases moisture and encourages saliva when being chewed and eaten, this helps swallowing and digestion. There are also benefits for the healthy maintenance of teeth and gums encouraged through chewing meat and bone, teeth will be cleaner and less prone to tartar buildup and potential long-term gum problems. Dogs can develop gum disease, which can be linked to heart disease. And finally, importantly – bones act as a cleaner when it goes through the system, offering a healthier digestive tract that encourages easier bowel movements and better overall well being for your dog. So, there it is, hopefully, the information has cleared up a few things for you and helps you to choose the right done for your best friend. As long as you take on board some cautionary advice there is no reason your dog can’t have a good bone to chew on every day. Remembering that basic hygiene is important too should benefit all, a rinse off after use and safe storage in between chews can literally be a blessing. Q: What is a rawhide bone? A: Rawhide is the inside of hide that is treated and rolled tightly to provide a tough, long-lasting chew for your dog. It is recommended that you supervise your dog with a rawhide bone, and remove any chunks that fall away as they have the potential to cause choking or internal blockages. Q: My dog is well past middle age, is it safe to give him a bone? A: If your dog has a healthy mouth, teeth, and gums and they don’t have any special dietary requirements, there is no reason he shouldn’t be able to have a bone. As will all recreational bones though, make sure you keep a watchful eye for chunks coming loose or the bone becoming small enough that your dog could swallow it in one gulp. Q: Can giving my dog a bone improve their dental health? A: Yes it can, simply put – the chewing action helps reduce tartar build-up, encourages saliva and jaw movement and stimulating gums. Added up, these separate actions lead to a healthier mouth, teeth, and gums for your dog. Some dental bones offer a flavoring that can also reduce bad breath. Q: Is chewing a bone good for my dog? A: It is increasingly becoming acknowledged that frequent chewing is beneficial for your dog, they are naturally conditioned to chew and by offering a bone on occasion can to some extent satisfy this urge. Puppies will also naturally want to chew as a human toddler does when they are teething, and you can get specific bones that are suitable for them so they can chew without harming themselves. Q: Are real bones better for my dog than synthetic bones? A: In nutritional terms; they are, they offer some important additions to your dog’s diet when offered for limited periods on a day to day basis. Synthetic bones are good to use because they are often made from tough nylon that is extremely long lasting and doesn’t tear into chunks easily. Use synthetic bones with caution just as you would real bones and check regularly for damage. Q: Can I give my dog my roast leftovers? A: It is recommended that you don’t give your dog any cooked bones, as they are more brittle than raw bones and can cause choking and blockages. Meat leftovers should only be given in small amounts and as a treat. Q: Are there any longer lasting dog bones available as my dog gets through them as if there was no tomorrow? A: You can find compressed rawhide bones which are rolled tighter than normal ones and are compressed to make them last longer, an alternative is a nylon bone which is made to be tough, durable and is longer lasting as well as being safe from splintering. Q: Which bone is best for my dog? A: There is no right or wrong answer to this, it is generally up to yourself and your dog to get the right one. As long as you match your dog’s size, chewing capabilities and correct bone size you should be able to source one that fits the bill adequately. Q: Do I need to supervise my dog whilst they are eating a bone? A: It is recommended that you do watch over your dog whilst they have their bone, that way you can watch to see if there are any chunks that fall off which may result in either choking or causing a painful blockage. Q: Do little dogs need to chew on bones too? A: Yes, little dogs get tartar buildup easier than big dogs. It is recommended that dogs of all sizes chew on bones. Essentially it will help with overall health and keeps them busy.